This CopyCat White Chocolate Mocha is one of the simplest coffee drinks to make and just as convenient, affordable and delicious as the coffee shop version. Ever since I made those Homemade Gingerbread Lattes I've been going crazy hunting down more coffee recipes to make. I will admit it I'm hooked! I never really thought to make copy cat versions of my favorite coffee drinks, but I really think it's the way to go. Don't get me wrong Starbucks is still the best, but I just cant afford my coffee addiction. Making them myself will really save me so much money. 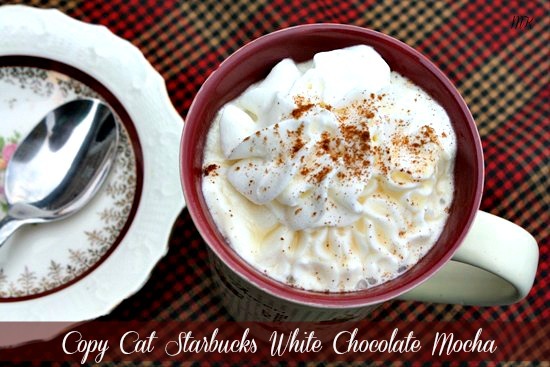 I was searching on the Internet and came across a copy cat version for my favorite Starbuck's White Chocolate Mocha. I have to admit using the Vanilla Syrup is definitely the way to go, but the syrup can be hard to find at times. We did find it online and have some on order but, until then I'm using this copy cat version I found. Update: Starbucks sells the flavored syrups. I was so surprised at how similar it tastes to the real deal. It was so creamy and yummy. This would be perfect to make for New Year Eve. What I love about this recipe is that is can easily be doubled or tripled. I prepared mine using the double boiler method, but I was thinking this could also be prepared in the crock pot for a party or large get together. After the chocolate chips melt just add the coffee and keep it on the warm setting. Make sure to place the whipped cream and garnishes next to the crock pot for your guests. I used the double boiler method that way the milk would not burn or scorch. I don't own a double boiler, but you can just make your own by adding the water to a pot and placing a glass bowl on top of the pot. This works just as well. 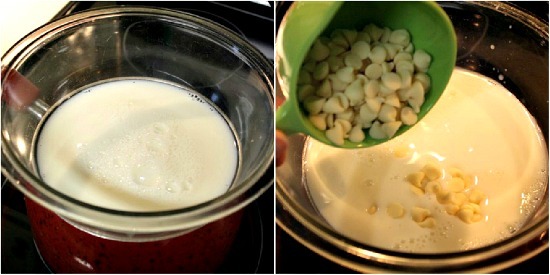 Add the milk and white chocolate chips to the glass bowl. Bring the water to a boil then lower the heat a bit and simmer. Stir the white chocolate. At first it will stick together a bit as the chips start to melt, but it doesn't take long for the white chocolate to start to melt. Make sure your milk is hot and steamy before you mix everything together. The white chocolate chips just melt away so nicely. I added about 1/4 cup of the milk mixture to a latte mug. Then added about a 1/2 cup hot coffee and then finish it off with more of the milk mixture. Using a spoon mix everything together. Add a nice dollop of whipped cream and a sprinkle of cinnamon for garnish. Add milk and chocolate chips to saucepan or double boiler and heat until the white chocolate chips are melted and milk is hot. While the chips are melting start the coffee.Pour about 1/4 cup of the milk mixture into a large coffee mug. 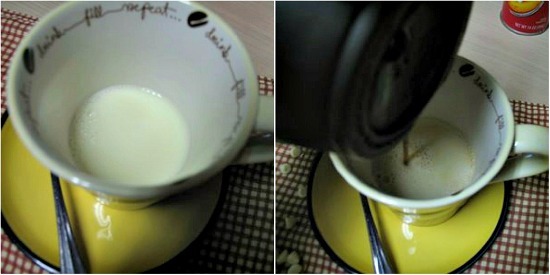 Add about 1/2 cup hot coffee and more of the milk mixture until it reaches the top of the mug. Make sure to save enough room for a dollop of whipped cream. If desired, garnish with a sprinkle of cinnamon, or chocolate shavings. Makes enough for 2 small mugs or one large latte mug. Cook's Note: This recipe can be easily doubled to make 3 large Latte Mugs. I love to double and triple this recipe and add it to a crock pot on the warm setting. This is wonderful during the holiday season. Oh wow! That looks really yummy. I'v found vanilla syrup at Walmart in the coffee aisle. I know they have hazelnut too and maybe another flavor. Hi Tiffany, I have the vanilla syrup as well. The white chocolate is so hard to find, they recommend using the White Chocolate Sauce instead of syrup to make the white chocolate mochas. Torani makes one but I only found the sauce online. Hey did you know you can add the vanilla to cake recipes and to coke a cola as well to make a vanilla coke how fun is that. Walmart sells the Divinci Brand the bottle are $3.63 each a steal. I found mine at Tom Thumb for $5.69 each, Torani brand (12oz bottles) We have a coffe house (Java Ranch) they sell the 6oz Torani brand for $4 I asked to purchase a large vanilla sauce and they just dropped their jaw and said we cant sell that to you. But now worry i found it online at the Torani website. Ü The recipe possibilites are endless. Another delicious one! I love it, white chocolate is my fave, too! Oh my!!! I must try this one, I love WCM's :) I've tried one recipe before, very different from this and it wasn't good at all! Thanks for sharing!!! Confession here..I never had coffee from Starbucks. Not only do I not drink coffee, but we live in the boonies nowhere near one. However, this looks wonderful! Mandi welcome to my site I love seeing and hearing from new readers. You mush try this WCM it really is good. I was surprised myself. Tanya I feel so lucky that you stopped by my site. I love YOURS!! I make a point to stop by The Sunday Baker everyday. I would love to live out in the boonies. I dont drink much coffee just my one cup in the morning but the WCM are treats for me I dont get them often so this is great to make them at home. The gingerbread ones are awesome as well. That looks really good! You have ME craving lattes now LOL!! Hey there!! I have been a stranger I know but I have missed coming here so I am catching up. And this is a great place to start. I do love Starbucks Lattes, otherwise I am fine with plain coffee from anywhere except Dunkin Donuts. This looks awesome!!!! Tina, what a wonderful recipe. I will have to try that tonight. Have a great New Year neighbor. May all your wishes come true in 2009. Love and hugs. I love copycat versions! Have you come across one for the salted caramel hot chocolate yet? Happy New Year! Aa my my, I love the same one too...sounds nice, you could make them at home!!! Good job dear. That would save me $5.00 each time I need a pick me up. To think I could be having this at HOME? YUMMY! Happy New Year!! Love your blog! Look forward to reading more recipes in '09. I nominated your blog for an award! Check out my cooking blog for the scoop on it. Wow and I thought TN folks were the only one who did that black eye pea for goodluck thing. I never liked them my mom was always like "you gotta eat just one at least", lol. Oh wow thank you so much for the nice comment. Thats the same reaction i said when me and my husband tasted it. It trully is divine and so much cheaper than starbucks. Enjoying this little beaut now!!! Thanks so much for sharing. My favorite Starbucks drink! Can't wait to try it in my own kitchen. Thank you for sharing! Thanks a ton for sharing this! I can't wait to try it, so I can stop giving starbucks my money! OMG!! You are my hero! This is my favorite coffee drink ever and I have always wanted to know how to make it! Thank you thank you thank you!! I love your whole website by the way. This is fantastic! It's my favorite starbucks recipe, but I can't afford to buy it very often. But, for less than $2 I can make it now. It was absolutely delicious!! Thank you! I just happened on your site when I was looking for the nutritional information on Starbucks White Chocolate Mocha. I have been making my own version of the mocha for a while now and mine is so similar to yours...the only difference is I use 2% milk and my process is different because I have a cappuccino machine. Great to see somebody else is making them at home too! If I wouldn't have started weight watchers I would never have looked them up and then I would have missed out on a new place to check for recipes! Wow! My wife was insistent that she have a Starbucks White Choc Mocha every morning...this was the BEST!! She was unsure and skeptical but is now convinced of this recipie!! Thank you thank you THANK YOU!! THANK YOU!!!!!!! I JUST made this for the very first time... it's still hot so I have to wait for it to cool but I couldn't resist a taste.. so far the two sips I've had... I LOVE that I can make this at home!!! I am very new to the whole coffee drinking scene, can't stand the taste of coffee..but I love hot chocolate. So one day when I was about to drop dead I stopped by the Starbucks stand in Target and asked them for a recomendation.. they gave me a WCM.. and I fell in love! However,any of our Starbucks are about 30 mins away across town.. So, it is just awesome that I can now make it for myself!! I didn't have a very strong coffee on hand so I just added some extra of the little package of trial coffee that I had..seems to have worked just fine. Great recipe! 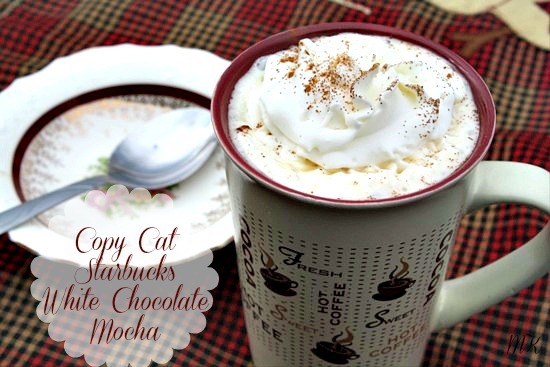 I love white-chocolate mocha and have been wanting to make it at home. this is abosolutely DELICIOUS!! i was going to the store to get stuff for blueberry muffins and wanted to try this out too... i was really hoping these would taste good because i spend so much money at starbucks! well done! I make this ALL the time. It is just as good as starbucks. If I do go to starbucks, I now get a regular coffee and tell then to put double pumps of white chocolate syrup and add cream. Tastes just like the white chocolate mocha, but for half the price. Looks yummy, thanks! My hubby will like this. You can make your own vanilla syrup, just make a simple syrup and add a vanilla bean to it. Simple, and cheaper! wow i was seriously thinking today that I wish I could make a coffee as good as a white chocolate starbucks mocha, its my favorite! I'm so excited to try it! I absolutely love white chocolate mocha's! Best coffee drink ever! Thank you so much for sharing this recipe, I am trying this tomorrow. It is Dec. 20th and it was nice to have a white chocolate mocha at home by the fireplace. I really enjoyed this recipe. Keep them coming. Hi, your recipe looks yummy and I cant wait to try it! Fyi, you can get a big bottle of white chocolate syrup with a pump at SMART AND FINAL stores if you have one in you area a nd I think it is the ghiradelli brand! Just made this Cmas eve morn & deeelish! Does anyone know though if leftovers can be stored in fridge?? Yumo & thanks for sharing!! I always store the leftovers in the frige, so I can enjoy it again the next day. Just reheat and enjoy. I found your recipe on Pinterest & in a word...fabulous!! Thanks for sharing, now I have to check out all of your other wonderful recipes! I just made this with Ghirardelli white chocolate morsels I had left over in my pantry. I used half and half instead of milk, and I microwaved the half and half and chocolate in a microwave safe bowl for 30 seconds, took out whisked it and microwaved for 30 more seconds. So easy and delicious! It tasts JUST like Starbucks' white chochlate mocha. Thank you for the recipe! Any suggestions as to how to convert this recipe to an Iced White Mocha? Of raspberry or blueberry in mine. Thanks!! I just made it for the first time... thank you its amazing! I cut the white chocolate a bit, because although I looooove white choc mocha from starbucks it's def more of a dessert then my morning coffee... fabulous!!! My ALL TIME fav is the White Chocolate Peppermint Mocha from Starbucks. I'd managed to get a bit of the same flavor by making peppermint simple syrup but never could get the rest of the flavor just right. You did it!!! I can't wait to try this and add to my peppermint syrup!!! I usually only drink one cup a day, so could I make this and store it in the fridge for future cups? How will it affect the texture of the milk/chocolate? Will it smooth back out once it's warmed up? Oh I just can't WAIT to try this!!! You also can buy the flavor syrups right from the Starbucks store. ok this does sound wonderful and for christmas morning I would love to make this ......where does the crock pot come into play?? LOL do you mix it all together except the whipped cream and just dish out cupfulls?? ?thanks for this recipe! It was listed in the post about the crock pot, but I will paste it here as well. Crock Pot: Prepare the milk mixture in the double boiler and then place it in a covered crock pot on the warm setting. Make a pot of strong coffee and place it next to the crock pot along with the whipping cream, cinnamon or white chocolate shavings. 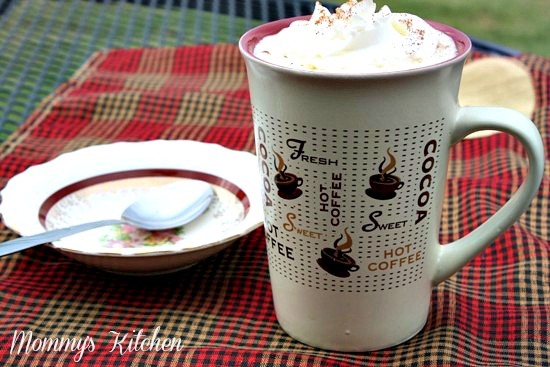 Your guests can make their own White Chocolate Mocha's. Or if you plan early enough you can just prepare the entire recipe in the crock pot. If you have a cash n carry in your area they carry 100's of syrup flavors and the white chocolate sauce.. Costco also carries wc sauce. I don't know if anyone else said this but….you can buy Starbuck's syrup at any Starbucks as long as they have enough in stock. I have purchased their Caramel and Raspberry syrups. The bottle is 1 liter (33.8 oz) and only costs $8.00. Much better than getting the 12 oz bottles at Walmart for $3-4! I am literally drinking one right now that I made using your recipe. Amazing! Thanks!! Hey just an FYI Starbucks sells most ingredients they use to make their drinks. Coffee, caramel sauce and all of the flavored syrups as well. Just made it. It tastes great. Thank you for the recipe. I love Starbucks! I can't wait to try this as soon as it starts snowing:)!! Thank you for posting this recipe! you mention vanilla syrup when talking abou the drink but then don't list it in the ingredients- so I am confused. Do you use vanilla syrup and how much do you use? The vanilla syrup was mentioned in the intro to the post. It stated that all the recipe I found online contained vanilla syrup and that it was so hard to find, so I used this recipe instead. Thank you for posting this recipe! I do not like coffee at all, but have been trying to find a 'warm me up' drink for the cold months ahead, and I think I just did. This is delicious! Looks deelish! Winter, here I come! I just stumbled upon your recipe on Pnterest the other day and decide I just had to try it. I am in LOVE with Starbucks and their white mocha! I decided I would try it a little different though. I made it in the microwave; I heated the milk for about 2 minutes and then added the chocolate chips, I microwaved in 30 second durations about 3 times until it was all blended and smooth. I have a Keurig so I just made a strong cup of espresso. It turned out great. I made extra to put in the fridge and try iced tomorrow. I was out of coffee creamer and came across your recipe on pinterest. Lucky for me, I had white choc chips on hand and whipped up a batch. It was AMAZING!! I recently got hooked on these but at almost $5 a pop its a very rare indulgence. Now I can enjoy one any time! Thanks for sharing! This was AMAZING!!! But I added a tablespoon of chocolate milk powder do the milk and its amazing! Thank you so much! You just saved me 4$ a day haha! I just made this, and it is perfection!! Thank you so much for sharing!! Almost all of Starbucks syrups can be purchased from any Starbucks store....and they are cheap (around $7/bottle). Just ask the barista to get you one from the back. You can't buy the mocha, pumpkin spice, or white mocha...BUT they have lots of vanilla on hand always. I'm a former manager. The recipes are easy to recreate at home. Wouldn't you just love 1% of all the savings you have afforded everyone from your recipe?! You could retire a wealthy momma! Haha! Thanks for the post! Looking forward to indulging! WOW! This taste just like Starbucks. Thank you so much Tammy. This recipe sounds wonderful and I will be trying it very soon. I just wanted to mention that you can buy the Torani White Chocolate SAUCE at World Market. I use about 1/4 cup of coffee, 3/4 cups of milk and 1-2 T. of the sauce. I am sure the sauce could be substituted in your recipe if you haven't any white chocolate chips! Thanks for sharing this recipe! I am IMPRESSED! I've tried many "copycat" recipes that were awful (many of which were probably user error), but this tasted amazing! Thank you so much! Very easy, and very yummy. This is a serious question that no one anywhere seems willing or able to answer. I'm surprised to never see it asked, either...and I've read many comments full of "stupid" questions! My own opinion is that no question is a stupid question, until it's been answered repeatedly within the same group, maybe. Many coffee recipes use it as an ingredient. What is considered "strong coffee"? I prefer instant, but ground will work. Please respond. How would I go about making this to take it to a Christmas party in a crock pot? I don't know if anyone else has mentioned this, but if you have a Starbucks around you, you can actually buy a large bottle of their vanilla syrup for about 8 bucks! So, is this whipping cream or whipped cream? You mentioned both but whipped cream is pictured. I can't wait to try this, I've been wanting to try the white chocolate Mocha at Starbucks for a while now, but my dad is cheap and won't spend the money on it (I don't blame him though :P) I swear, if I like this, you will save my college experience :) I'll probably make this tomorrow to get my christmas presents cranked out tomorrow. Making everything by hand is tough, but any energy I get will help. I made this today and kept it warm in the crockpot. It was so easy and everyone loved it! Thanks! Made this substituting the whole milk for 1/2 heavy cream 1/2 skim milk. Fabulous!! Strong coffee is just as it states. Regular coffee made stronger. To make strong coffee just increase the amount of ground coffee by half a scoop for every scoop of coffee you use. Here is a link on how to make strong espresso type coffee using instant coffee. Just made this and I love it. I put it on ice and added more coffee. Perfect. Would it taste even better adding vanilla extract or vanilla syrup? Did you use chocolate chips or white chocolate chips? Your comment says chocolate chips?? If you use white chocolate chips you don't need vanilla extract or vanilla syrup. Cool whip isn't a ingredients in the listing. We garnished ours with whipped cream. Add a shot of peppermint syrup to it. Ahhmaazinng. Brilliant, tastes just like the Starbucks White Chocolate Mocha. Definitely my new favorite; will be making this a lot this winter! Just tried this! very yummy! I used banana bread coffee. It was great. Hi I am wondering just how to mke the sauce I have an espresso machine so I'm guessing just melting some white chocolate chips will work? Wow! Thanks for putting this recipe online. I love it!! Tastes so much like starbucks. Then second time I did it I tried half white chocolate chips n half regular chocolate chips and it tastes like a mocha. But white chocolate is my fav. Thank you again!!! I made this this morning, and it was sooo good, but TONS of calories!!! Any thoughts on how to make this drink "skinny"?? Was just reading your blog. First let me say I love white chocolate mocha. I too was spending $$$ at the coffee houses. When I retired, I bought my own espresso machine and found the white chocolate mocha syrup. While using the syrup I noticed it looked and smelled like sweetened condensed milk. Low and behold I have be using sweetened condensed milk in my lattes for years and it is much cheaper than the white chocolate mocha mix or the vanilla syrup. I do also use the vanilla syrup for my iced drinks, but for hot whites the sweetened condensed milk works great. In Hawaii they call it Thai coffee or Hawaiian coffee. It is the bomb and does not harden as it cools. I use espresso, non-fat milk, and 1 and 1/2 ounces of sweetened condensed milk for a 20 ounce drink. You can adjust the ratios to suit your own taste. I can't find chocolate chips. Can I just use regular white chocolate? Oh sweet lords of Kobol! Thank you for posting this! I am addicted to Starbucks' White Chocolate Mocha and I'm spending a year abroad and they have no Starbucks! How insane is that!?!?! Thank you! Thank you! How do you measure out the recipe to make a crock pot full? This is SO good! Drinking a cup right now! Just like sStarbucks! Love it. Yes! I was wondering that! Vanilla hmmm I will try. If you have a World Market near you, you can find Torani flavored syrups and sauces. They even carry the sugar-free versions of the syrups. I was wondering though, at which point would you mix in the vanilla syrup and how much? There is not vanilla syrup in this recipe. It uses white chocolate chips. Oh my goodness! I am swiftly falling head over heels in love with your blog! I've got your cookie dough (which tastes amazing already) in the fridge. I've earmarked your rolls to bring to a lady's night. And now I've found this recipe for my absolute favorite coffee drink. This Christmas is going to be steeped in MommysKitchen! I think we'll be thinking of you and your family every Christmas Eve from here on out! Oh EloquentlyMe what a blessing your comment is. Thank you so much for taking the time to look through my site and post such a wonderful comment. I hope you like all the recipes. Have a blessed christmas. This looks so good!!! I got the sugar free white chocolate. I don't love the taste but with gestational diabetes there are sacrifices I have to make. I had one this morning from starbucks and my blood sugar was ok!! I will have to try this!! Thank you!!! The roads were snowy so I decided against a trip to starbucks & found this online... SO delicious! I used pumpkin spice chips in place of the white chocolate ones, left off the cool whip, & used 1 1/2 medium keurig cups of coffee & it was fabulous. I'm going to be making this again for sure! I'm so happy I found this!